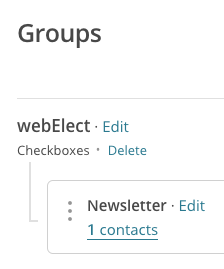 Linking to MailChimp allows you to link webElect Groups/Tags with MailChimp List Groups such that anytime a voter is added to one of your webElect Groups/Tags and has an email address, they will be saved into your MailChimp List and its associated Group. 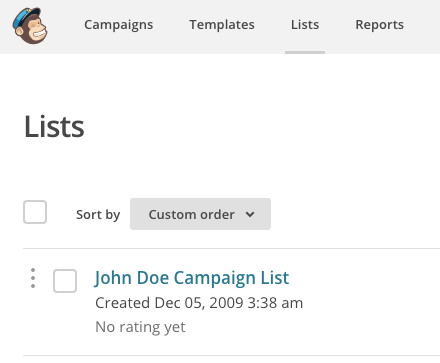 This works especially well when combined with webElect's website Signup forms as it allows you to easily collect email addresses for your MailChimp email campaigns. 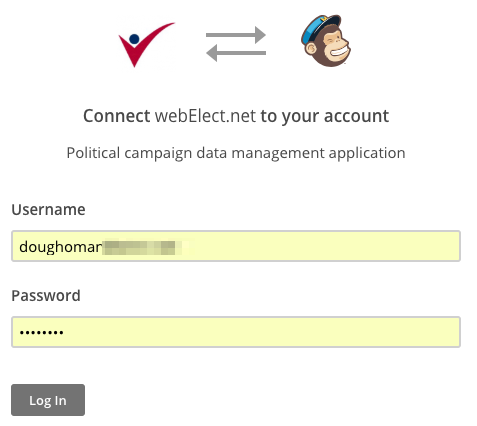 webElect's Signup forms are advantageous as they interactively match the signup info to the voter record. This allows targeted email campaigns based on any voter registration trait such as precinct, party, already voted status, etc. Here are the steps needed to establish the link from your webElect campaign account to MailChimp. 1) If you have not already created a MailChimp account, do so. 2) From webElect's new interface, click Main Menu->Administration->Tags. The Administration section is only available to admin level users. If you are in the old interface, you can access the new Main Menu by clicking the link in the lower right corner of the old Main Menu. 3) From the Tags admininistration page, click "Link Email Provider"
4) Click the "Connect MailChimp Account" button. That will take you to MailChimp's authorization page to link to webElect and may require you to login. Use your MailChimp login credentials. 5) After granting permissions, you will see MailChimp is now linked and gives you the option of selecting a tag to use for Unsubscribes. 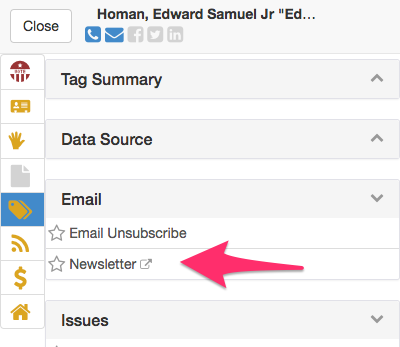 This tag will be added when an email address clicks an unsubscribe link in your emails. We do not remove them from the original group/tag as you may sitll want to use that group/tag for filtering. 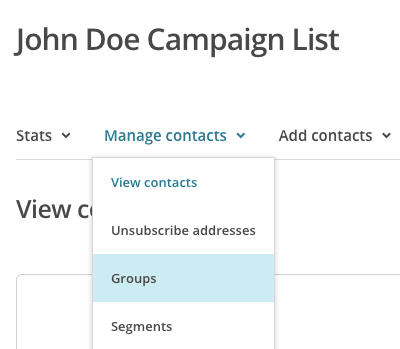 6) Now you can link the tags you want to populate your MailChimp lists when new voters/contacts are added to the tag (existing tag members will not populate in MailChimp). This is done on the Advanced tab of the Tag's edit form. In our example, we're going to create a new Tag to track our "Newsletter" opt-ins. 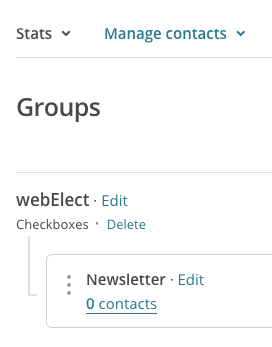 On Advanced tab, we click to "Add New MailChimp Group" and name it "Newsletter" as well. In our tag listing, the icon next to the "Newsletter" tag indicates the tag is linked and pushing addresses to an Email provider. You should see a "webElect" group was created with a sub-group of "Newsletter". 8) Anybody we add to a linked group/tag and that has an email address will push to MailChimp EXCEPT when added via bulk Import or an "Add To Group" output option. After up to 1-minute, we can see the record has pushed to MailChimp. 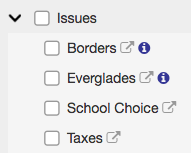 Linking Issue tags from webElect allows you to send different email campaigns based on the issues voters have expressed interest in. These tags can be added to sign-up forms placed on your website and collected either via a single form with survey style checkboxes, or via multiple forms, 1 per issue, and placed in the corresponding issue section/page of your site.